1.1 We appreciate your interest in our products and services and your visit to this website or our store. Your privacy is important to us and we want you to feel comfortable with how we use and share your personal information. 1.2 This policy sets out how Streetbike handles your personal information, including when and why it is collected, used and disclosed and how it is kept secure. 2.1 We are Ma-Shell Motorcycles Ltd. trading as Streetbike. There are currently no separate group companies within Ma-Shell Motorcycles Ltd. However, we do trade as “Streetbike” for Suzuki, Yamaha and Zero franchise operations and as “Triumph Birmingham West” for Triumph franchise operations. Ma-Shell Motorcycles Ltd trading as Streetbike is the data controller for all franchises. A ‘controller’ is a company that decides why and how your personal information is processed. Personal information you give to us: This is information about you that you give to us by entering information via our websites or our social media pages or by corresponding with us by letter, phone, email, in-store or otherwise and is provided entirely voluntarily. The information you give to us includes your name, contact details (such as phone numbers, email address and address), enquiry details and your opinion of our products and services. Personal information we collect about you: We may automatically collect the following personal information: our web servers store as standard details of your browser and operating system, the website from which you visit our website, the pages that you visit on our website, the date of your visit, and, for security reasons, e.g. to identify attacks on our website, the Internet protocol (IP) address assigned to you by your internet service. We collect some of this information using cookies – please see here for further information. We may also collect any personal information which you allow to be shared that is part of your public profile on a third party social network. Personal information we may receive from other sources: We obtain certain personal information about you from sources outside our business which may include motorcycle manufacturers and importers, Finance providers, clothing suppliers, accessory suppliers, insurance providers and government agencies. For Example: Yamaha UK, Suzuki GB plc, Triumph Motorcycles, Zero Electric Motorcycles, Black Horse Motorcycle finance or other third-party companies. The personal information received is as described in the two paragraphs above. to share your personal information with our authorised suppliers when it helps to facilitate your enquiry and/or a buying decision. For Example: in arranging a product demonstration or where you have requested information and/or a call back. To contact you via email, text message, post or telephone with marketing information about our products and services (see Marketing section below for further details). For Example: MOT reminders, new offers, and events and ride-outs we are planning. To share your personal information with our authorised dealers or our recommended third-party partners for them to contact you with information about their products and services. Please see the Marketing section below in this policy to find out more about these third parties. For Example: Yamaha, Suzuki, Triumph, Zero, Dainese, Datatool etc. Some relevant examples are shown below. This list is not exhaustive. To allow for the provision of third party breakdown services by our breakdown providers. To exchange information with third party finance providers in order to facilitate the purchase of product via provision of a finance agreement. To exchange information with suppliers of security products where personal registration is required for the product to be effective. Black Horse, Close Brothers and other finance companies for the facilitation of finance agreements. DPD, Royal Mail and other delivery companies for online sales deliveries. We may use your personal information to contact you if there are any urgent safety or product recall notices to communicate to you or where we otherwise reasonably believe that the processing of your personal information will prevent or reduce any potential harm to you. It is in your vital interests for us to use your personal information in this way. To verify the accuracy of data that we hold about you. We may share your information with other companies within the Ma- Shell Motorcycles Ltd Group. They may use your personal information in the ways set out in “How we use your personal information” in Section 4, in connection with products and services that complement our own range of products and services. For Example: Transfer of information between Streetbike and Triumph Birmingham West. Both dealerships owned and run by Ma-Shell Motorcycles Ltd. Please visit About Ma-Shell Motorcycles Ltd in Section 13 for the details of our group companies with whom we may share your personal information. We may disclose your information to our third-party service providers, agents, subcontractors and other organisations for the purposes of providing services to us or directly to you on our behalf. Such third parties may include cloud services providers (such as hosting and email management) or advertising agencies, administrative services or other third parties who provide services to us. We may share your information with other companies within our Authorised Dealer Network. They may use your personal information in the ways set out in “How we use your personal information” in Section 4 or in connection with products and services that complement our own range of products and services. For Example: Finance or insurance products. For Example: All the Manufacturers of any product we sell or providers of any service we supply: Bikes, clothing and accessory manufacturers and importers as well as retail finance and insurance providers. We may transfer your personal information to a third party as part of a sale of some or all of our business and assets to any third party or as part of any business restructuring or reorganisation. We may also transfer your personal information if we’re under a duty to disclose or share it in order to comply with any legal obligation (e.g. by sharing your personal information with the DVLA or DVSA or the police), to detect or report a crime, to enforce or apply the terms of our contracts or to protect the rights, property or safety of our visitors and customers. 6.1 All information you provide to us may be transferred to countries outside the European Economic Area (EEA). By way of example, this may happen where any of our group companies are incorporated in a country outside of the EEA or if any of our servers or those of our third-party service providers are from time to time located in a country outside of the EEA. These countries may not have similar data protection laws to the UK. For Example: Feedback to and from Japanese manufacturers in order to improve their product and to improve your experience of their product. 7. HOW LONG WE KEEP YOUR PERSONAL INFORMATION FOR. You have a number of rights in relation to your personal information under data protection law. In relation to certain rights, we may ask you for information to confirm your identity and, where applicable, to help us to search for your personal information. Except in rare cases, we will respond to you within 30 days after we have received this information or, where no such information is required, after we have received your request. Where we rely on your consent as the legal basis for processing your personal information, as set out under “How we use your personal information” in Section 4, you may withdraw your consent at any time by contacting us using the details at the end of this policy. If you would like to withdraw your consent to receiving any direct marketing to which you previously opted-in, you can also do so using our unsubscribe tool. If you withdraw your consent, our use of your personal information before you withdraw is still lawful. You may object to us using your personal information for direct marketing purposes and we will automatically comply with your request. If you would like to do so, please use our unsubscribe tool or contact us using the details at the end of this policy. In these situations, we may only process your personal information, whilst its processing is restricted, if we have your consent or are legally permitted to do so, for example for storage purposes, to protect the rights of another individual or company or in connection with legal proceedings. Where we rely on your consent as the legal basis for processing your personal information or need to process it in connection with your contract, as set out under Section 4 “How we use your personal information”, you may ask us to provide you with a copy of that information in a structured data file. We will provide this to you electronically in a structured, commonly used and machine-readable form, such as a CSV file. Ma-Shell Motorcycles and companies within its group use technical and organisational security measures to protect the personal information supplied by you and managed by us against manipulation, loss, destruction, and access by third parties. Our security measures are continually improved in line with technological developments. ‘Cookies’ are small pieces of information sent to your device and stored on its hard drive to allow our websites to recognise you when you visit. 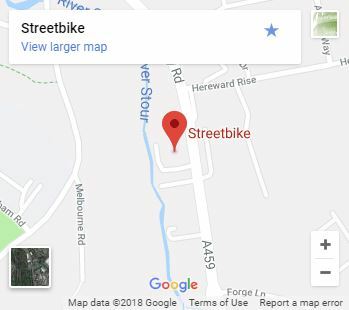 Information on the cookies that we use, and their features can be found here https://www.streetbike.co.uk/cookie-policy/. In addition, if you linked to our website from a third-party website, we cannot be responsible for the privacy policies and practices of the owners and operators of that third-party website and recommend that you check the policy of that third-party website. We may use so-called social plugins (buttons) of social networks such as Facebook, Google+ and Twitter. If you register an account with us online. If you purchase products from us in store. If you want an MOT or service reminder. 10.2 We may contact you with targeted advertising delivered online through social media and platforms (operated by other companies) by using your personal information or use your personal information to tailor marketing to improve its relevance to you, unless you object. For Example: Third Parties relevant to the motorcycle business i.e. Suzuki, Triumph, Yamaha, Zero motorcycles and the companies listed in section 4.3. Our group companies as detailed in Section 13 below. MA-Shell Motor Cycles Limited Trading as Streetbike. MA-Shell Motorcycles Limited trading as Triumph Birmingham West. If you have any questions, suggestions or complaints about the processing of your personal information or wish to contact us to amend/update your marketing preferences with a UK company within the Ma-Shell Motorcycles Group, please contact the Streetbike Data Protection Co-ordinator. Motorcycle Dealership: Triumph Birmingham West. Both companies share the same contact details as shown above. This policy will be updated as further group companies are added.